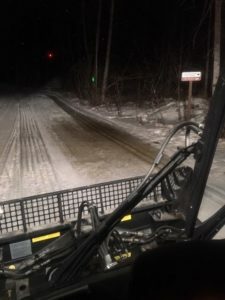 Groomed most of the trails this morning for the Sonot. Unless temperatures fall to below freezing at night soon, this ski season will be over by the end of next week. Cooler temps and a good shot of snow can change conditions and plans. Roller Coaster, Outhouse, Sunnyside all have lots of bare spots, pond is forming at the Sonot Jct on the White Bear. Black Hole is very soft.